DrWho started as a TV show in Britain about 40 years ago but how it's become "part of the fabric of British society". Everyone knows and loves it. So it was a real stroke of genius for the BBC to make a Dr Who themed Prom. The market is huge - not just kids (of all ages) but their parents, grandparents and anyone bemused by the phenomenom. And no compromise on quality either ! Seriously good music, seriously well played and even a daring new work by Mark Anthony Turnage. (who has little kids but doesn't write "down" to them). It may be cutting edge but people like kids have open minds and don't come with prejudices set in concrete. After all what Dr Who is "about" is facing new challenges. This was the biggest seller so far this season, tickets selling on the black market for the amount you can pay on your mortgage. So it's proof that imaginative music works ! Congratulations to the BBC ! This is the way to reach people left cold by the (false) elitist image of classical music. Please click on the link at right to boulezian in the blogs list, Mark Berry's blog. He's been in Munich at the opera, having a Strauss fest. Since Mark is one of the best writers on Strauss this is good. Scroll down to Jonas Kaufmann, too. I wonder why Eva Marie Westbroek is singing Chrysothermis while Schnaut is singing Elektra ? But Schnaut seems to be the star of this series. Who is Dr Who, readers outside UK might ask. Read this beautiful piece ! It's by Nick Breckenfield, so you can count on intelligence and wit ! Messiaen's La Transfiguration de Notre Seigneur Jesus Christ is a blockbuster - 200+ singers, huge orchestra, 7 soloists, three banks of marimbas and a drum 2 metres tall. It could have transfigured the Royal Albert Hall, blasting us into the divine. But it didn't. Excellent playing from the massed forces, held together courageously by Thierry Fischer. But gargantuan proportions in Messiaen do not operate in nearly the same way as in, say, Bruckner or Berlioz. This music is profoundly spiritual, so the key, I think, is understanding what type of spirituality Messiaen seeks to invoke. Messiaen isn't "churchy". On the contrary his vision takes in vast panoramas, stretching into infinity. His spirituality isn't polite, socially sanctioned propriety, but connects more to the heterodoxy of the Middle Ages. :Look at those paintings of the saints Messiaen loved - they glow ! They are "high" on their beliefs. This isn't "established church" propriety. A good performance can capture the supernatural frenzy such intense spiritual abandon can produce. Messiaen was steeped in early music and knew all about religious intensity. At once, he's pre modern and a modernist. And the birds...Messiaen studied them as they really were, movements, habitats, etc. His birdsong is nothing like birdsong in, say, Schubert or Mahler. The cacophony in La Transfiguration has nothing to do with bigness for its own sake. It's there to celebrate the vast diversity of creation. It's like a dawn or evening chorus made by every bird in the universe. The cacophony comes straight from nature, it's free, liberating and totally uncivilised. After all, men don't transfigure into God every day. When they do, shouldn't there be wild, unrestrained ecstacy ? On birdsong in Messiaen: another aspect of Messiaen that shouldn't be taken too literally. Ornithologists probably get a lot out of Messiaen because they can identify specific birds and know why Messiaen used which bird when. But good ornithologists also know that birds don't just sing - they observe their movements, habits, habitats. Birdsong in Messiaen is nothing like birdsong in, say, Schubert or Mahler. Messiaen studied birds from life. So he knew they don't sing nice little melodies, they sing to mark territory, to alert others, and also because they enjoy it. Even the most eloquent sing in snatches, breaking off in different directions, following quirky rhythms and intervals. It operates simultaneously on many levels, so what may seem like cacophony is in fact clearly defined. So Messiaen's birdsong is radically different. Only Janacek, who notated the chickens in his yard, comes near. Messiaen's birdsong defies form, and even conventional line and pitch. It's organic, evolving of itself, rather than from a preconceived harmonic idea. It moves, changes direction, follows odd little riffs and cells. Listening to Messiaen this year has enriched my feel for Boulez tremendously. Nadia Boulanger's intense dislike of Messiaen and his circle extended to Boulez and even to Yvonne Loriod, who was instantly dropped when she took up with Messiaen. Her influence on many English language writers and musicians still prevails. Perhaps Boulanger, who did have a good ear, but was fixated on Stravinsky, realised where Messiaen might be heading. Listen to this Prom online on http://www.bbc.co.uk/proms/2008/. It was also televised so you can watch the film, too ! The live performance was spoiled because the music had to stop for regular radio commentary. Of course people benefit from knowing "about" the music but interrupting a performance kills whatever atmosphere there might be, so it's self defeating. Goethe's Colour Wheel in music ? that's one of the premises of Simon Holt's Troubled Light premiered tonight at the Proms. Holt is one of the big names in current British music so no surprise he's been named composer in residence for BBCNOW (National Orchestra of Wales) But "newly written" isn't the same as "new". Holt's five-part piece is way better than some previous Proms commissions (not Holt's) but the point is that The BBC and the Proms actively encourage living composers which is extremely important. In the long term better to hear lots of possibles than dismiss the new unheard. Pamela Blevins' dual biography Ivor Gurney and Marion Scott, Song of Pain and Beauty will be published by the Boydell Press in November. Based on original research and newly discovered material, Song of Pain and Beauty is the first biography of Gurney since 1978 and the only biography of Scott. It tells the dramatic story of two geniuses who met at the Royal College of Music in 1911 and formed an unlikely partnership that illuminated and enriched the literary and musical worlds in which they moved. Gurney's poetry and songs have taken their place as "part of the inheritance of England". Marion Scott, Gurney's strongest advocate, emerges from his shadow for the first time. Her own remarkable achievements as a pioneering music critic, musicologist, advocate of contemporary music and women musicians place her among the most influential and respected women of her generation. News of a new online music magazine that features women in music. Of course women musicians don't exist in limbo so there's plenty on music in general, but from a perspective that doesn't denigrate women to footnotes. This ought to be good as it's editted by Pam Blevins and Karen Schaffer who know their stuff ! "This magazine is an indispensable resource for teachers, students, parents,musicians, historians and music lovers of all ages throughout the world.Designed in a traditional printable magazine format, Signature offers over 90 pages of articles about women who have made significant contributions to the world of music. No other magazine offers so rich a resource on the achievements of women in classical music." ".....You might have been mistaken that you were hearing the organ again in the massive, long chords that start Et exspecto resurrectionem mortuorum. They cleave through space like a powerful force of nature, yet they are created only by brass and winds, principally trombone and tuba. Then suddenly the percussion explodes, the organ this time replicated by gongs and cymbals. It’s incredibly compelling, yet requires small though unorthodox orchestral forces. No wonder it’s the piece being played most frequently all over the world this year of Messiaen’s centenary. For my longer more detailed analysis of the piece please see HERE. It was originally commissioned by the French government as a showpiece to commemorate the dead of two world wars. But Messiaen wasn’t one for public platitudes. For him, death was only an interlude before an eternal afterlife. The government couldn’t very well object since he had been a prisoner of war and might very well have ended up with the war dead himself. Et exspecto resurrectionem mortuorum is a counterpart to the Quatuor pour la fin du temps (Quartet for the End of Time. Both pieces see beyond earthly suffering, focussing on the prophecy that, at the End of Time, all who have died through millennia shall be resurrected. The massive walls of sound in this piece represent the earth itself, a primeval sound like the moving of continents, earthquakes that break open the earth’s crust. It’s mightily organic writing : Birtwistle’s Earth Dances, magnificent as it is, is but an echo. Those familiar with other Messiaen work might also recognise the “walls” in L’Ascension, Des Canyons aux Étoiles and so on. Indeed, Messiaen dreamed that Et exspecto might ideally be performed in mountains, sound bouncing from peak to peak, reverberating deep into valleys. Truly, The Royal Albert Hall must be the closest alternative. That overwhelming rush of sound, percussion waves ripping across the orchestra, was cataclysmic. The very earth is torn asunder. Of course this music is loud, propelled by relentlessly solid blasts of brass and percussion. The End of Time is a cataclysm. For Messiaen, the world doesn’t “end with a whimper, not a bang”. Like the movement of tectonic plates, generally unfolds slowly, without obvious progression. Instead it’s like a slow procession punctuated by minute long moments of complete silence which are as much part of the piece as the music itself. Myung-Whun Chung observed these faithfully, because what Messiaen is doing is turning the music inwards, “into” the listener, a cue to contemplate the mystery “beyond” mere sound. This is another of Messiaen’s great challenges. He combines different concepts of space and time. So they operate simultaneously, processed by the listener’s mind. Loud as parts of this piece may be, it’s not volume for its own sake. Again, as in all Messiaen, details are essential. The clarinet, oboe and flute parts were gloriously clear and poignant, and the gamelan’s quirky rhythms wonderfully evoke the way birds move and sing : nature and orchestration in perfect correspondence. Particularly impressive in this performance was its uncompromising, rough hewn quality that really brought out its primordial, antediluvian depths. In some ways, the savagery of this performance outclassed Boulez in recording (though I suspect that Boulez live and in the Royal Albert Hall would lift us out of our skins). The banks of brass and percussion were magnificent, the crashing cymbals and gongs relentless, the gamelan creating a wild frisson, the tubular bells sounding out like the Final Trumpet. Chung’s hands bristled tension, and tension is what his players produced. This was perceptive, as the End of Time isn’t a wimpy cop-out anticlimax. Those who listen to the rebroadcast on BBC Radio 3 might listen out for the “circular” effects in the percussion, where there’s marked rhythmic progression. At he very end, one of the small gongs flew off the stand and the percussionist had to improvise. It’s not very noticeable, but there is a difference, so carefully nuanced is Messiaen’s writing." Listen to this concert on BB Radio 3 broadcast - it is fantastic ! And they are also running a stream of the TV version. Don't miss ! Also read Evan Tucker's Preview which is on promsamerica on the blog list on the right. It's very informative. We're so accustomed to taking Messiaen's music on surface terms that it's not easy to hear past the obvious signposts, like birdsong, religion and exotica. But Messiaen wasn't revered by people like Stockhausen, Boulez, Xenakis etc. for nothing. What he does in his music is actually fundamentally radical. From birds, he rethinks the idea of melody and rhythm. Birds don't do "songs" they jerk, twitch and fly off in odd tangents. Nature is dissonant, many voices in cacophony. Thus the exotica. You don't "need" a single thread, things happen at different levels at the same time, you process them in your mind. The very idea of space is "sculpted", by the place we hear, by the open-ended horizons. Even his loopier dead ends are fun because they don't fit the idea that everything has to be neat and "right". Then, the timelessness. Messiaen makes us slow down and reflect. His silences, turn you back into yourself. Hence the vignette form, small portions on which to contemplate, on their own and in context, breaking down the idea of music as one impenetrable, structured edifice. No symphonies ! In Catholic Churches there's something called the Stations of the Cross where people look upon an image but silently meditate. You don't "have" to think about the image, you are alone with your thoughts and no one knows but you and God (assuming you believe). What it does to you and to your soul is far more important than what's depicted. And Messiaen is happy ! Not in the idiot grin sense but Seligkeit, eternal bliss which allows that there are things we will never know : it's OK to acknowledge powers greater than the self. In our times, cynicism and meanness of spirit seem to be the rule. Yet Messiaen subverts that too, by sheer simple purity. No wonder he confounds. We need his gentle challenge more than ever ! Nige's triumphant return to the Proms ! Lovely performance, but poignant, for it shows how stupid the kerfuffle of 20 years ago really was. Artists have artistic personalities : they aren't the kind of people who conform. Many good ones would probably be nuts were it not for the discipline performance forces on them. Twenty years ago Nige did seem shocking, but he's been vindicated. The Proms started to veer downmarket (MUCH better this year), but Nige realised that as long as the music is high quality it doesn't matter if you dress like a punk and have attitude. In his own way, he's done as much to bring people to classical music as many others. It would probably have been a bit too much for the BBC to put Nige on the First Night, but Prom 2 made amends. Maybe now we can all get on with the music. It's the music, guys, not the packaging ! One day I suspect we'll have"Sir Nige" though I can't imagine him softening that much. Gerald Finzi is one of my big things so I listened too for his Intimations of Immortality which doesn't get all that many live outings as it's a monster of a piece - large orchestra, large choir and tenors with the stamina to blast over them all for 45 minutes. As Finzi himself said it's a "hell of a noise, but rather a wonderful noise all told". It has its weaknesses as it was written in a rush and it's way, way bigger than anything else the composer wrote. Stephen Banfield, Finzi's biographer, wrote that the chirpy little melody that illustrates the words "this sweet May morning" was "one of most sly pieces of mickey-mousing outside Hollywood". But for an innocent like Finzi, writing in the gloom of postwar British austerity, Hollywood represented the glowing vision Wordsworth's text describes. The vision is extravagant, so why not the music ? In performance, it does need to be kept under reasonably tight rein, so excesses like the xylophone solo don't exaggerate and descend into The Donkey Serenade as they do on one recording. No worries here. Andrew Kennedy (no relation to Nige, they are worlds apart) was heroic. Catch the broadcast repeated on demand online, (Prom 2 Part 1 after 20 mins of Bax) and also listen to the recording by James Gilchrist with David Hill at Bournemouth (Naxos) which is the finest of all, I think. First Night Proms = the real star ! This isn't a review - anyone can do that and I don't do moreofthesame. Instead I celebrate the real star of the First Night of the Proms, the magnificent organ at the Royal Albert Hall. . Organ's don't tour and the RAH is too big for most concerts, so it was wonderful of the BBC to acknowledge this organ, so often overlooked and underused. Indeed, this was a special experience as the camera took us straight into the loft itself, to see what happens in more detail than you'd imagine from the arena. This organ is a National Treasure, one of the biggest in the world, now restored to its full glory. It has nearly 10000 pipes, 150 stops, 4 fingerboards and many pedals. It'sthe ultimate one-man band. At first it had to compete with Strauss's rows of shining brass for visual impact but then came Messiaen's Dieu parmi nous, from La nativité du Seigneur. Sudddenly the auditorium seemed to explode with sound and colour. Even if you know nothing about Messiaen and his beliefs, you knew you were in the presence of something utterly extraordinary. and exuberant, obliterating all gloom. If I could write this text in shimmering gold, like the rays of the sun, you'd get an idea of the impact. For those of a non-spriitual bent it was like Battlestar Galactica looming into view, a universe of its own, teeming with life, filling the emptiness of space. From Messiaen to his "adopted son", Pierre Laurent Aimard, playing a piece written for him by another of his mentors, Elliott Carter, who was born one day after Messiaen, 100 years ago. The title, Caténaires, refers to the spiral structure of rope or cable, which holds disparate things together without obliterating their identity. It's a metaphor for this music, for the relationship between these artists, and indeed for the BBC Proms itself which brings together so many threads of music, and audiences from all round the world. People don't associate the BBC Proms with opera because there's no staging. But it's a great venue for operatic music. Find out why the rest of London's music life shuts down for the summer. Look at the photo !!! See the Rake's Progress at the Royal Opera House because it IS different. Robert Lepage the director transposes the action to Hollywood in the early 50's. This is valid enough in theory because Stravinsky loved the US and the moral story in The Rake's P is universal. So the references to "Oklahoma !" were apt enough. I liked the idea of Tom's magic machine as a TV set showing a 50's kid in cowboy suit stealing a packet of tacky Wonderbread ! Certainly this production is a colorful extravaganza - sit well back up in the rafters for best effect and avoid the flashingneon if you're epilectic. But a little can go a long way..... To use Lepage's Hollywood analogy, this was a shoot out between opera and staging and the staging won. The problem is that this opera borders on "chamber" where the devil is in the detail (sorry Nick Shadow !). Every word of that wonderful libretto crackles with arch deviousness which Stravinsky's setting exploits deliciously. And those neo- classical baroque references are there for a purpose. This is music to listen to if you don't believe harpsichords can do wild atonal dissonance ! So the extravaganza/spectacular approach overwhelms after a while. Had the orchestra fought back maybe it might have worked but it seemed as seduced as Tom Rakewell by the glitz. What this needed was acerbic irony and savage wit, to bring out the tension sparked by Stravinsky's mix of formality and modernism. Even nice guy Haitink was whippped into lucid starkness with David Hockney's Glyndeboune production of 1975 - sharp black and white, surreal and no compromise ! Good enough singing - Sally Matthews sings with tough conviction so she's more than an airhead bimbette but John Relyea was divine ! Which is an odd thing to say about The Devil, but that's why he's so convincing. What a voice ! Once heard this is a voice you don't forget ! I first heard him 7 years ago in Enescu's Oedipe at Edinburgh when he was relatively unknown, where he "made" the opera come alive. He was outstanding ! And he's still under 40. But again, the singers had to compete with the staging and were outdrawn. Significantly LePage seems to think of Baba the Turk as a kind of Gloria Swanson in Sunset Boulevard. But Baba is quite the opposite. She's the one person in the whole opera that doesn't stay deluded long. Her role is crucial to the whole morality. She's the counterweight to Nick Shadow. He's seductive, she's ugly, he's persuasive, she's unloved. But he's the devil and she's a good soul who proves it by being kind to Ann while he's out to destroy Tom. Note, the devil loses the game of cards and goes to hell. So Baba may babble but Baba survives ! A lot goes right in this production, and audiences will love it "as" theatre. But it's carried away with the thrill of its own success. This was the Cold War after all. That cosy conformity was shaped against a background of paranoia and danger. For a moment Lepage does hint at things unseen, like when a "mushroom cloud" rises from the floor. But it turns into a movie star trailer. Stravinsky, Auden and Kallman were writing a moral fable, so without th harsh edge of moral dilemma, the opera can fall flat. They were writing against a background of McCarthy and the Hollywood Trials after all, when artists could be destroyed because they didn't buy the materialism this opera condemns. The auctioneer scene is crucial - you can't buy values any more than you can buy the nobility that comes with the Roman bust whatever the auctioneer may suggest. Here's where you could buy the new "NO-HORN" machines to play the latest records. Wow, wind the machine up and it will play for all of 15 minutes before you have to crank it up again ! And such sound quality ! You didn't need to push your ear into the horn to hear. I knew a man who as a small boy had the job of winding the machine and changing records for his invalid father who loved opera but was bed ridden. The man (boy) said he used to jump up and down all day and "learned" opera in short doses. No chance of a Ring cycle then. The shop in the postcard was owned by one of my ancestors and apparently was the hip place to hang out in 1910. Click on photo to enlarge. Look at the farmer's hats, proper Cantonese land farmer hats, noit the famous Hakka hats photographers like. One of the regular customers at this shop pre 1914 was the captain of the German battleship the Emden. Look up Karl von Muller on google - REALLY AMAZING story. Mark Berry has been in Aix for the festival : See his blog Boulezian for reviews of Zaide and Dusapin : I like Dusapin's music very much and loved his Faust opera "The Last Night" available on DVD. Mark's adding more about the festival - see his blog ! It's on at ROH ! But there's one I made earlier, Glyndebourne 1975. As different a production as you can imagine ! This production connects to the original Hogarth etchings Stravinsky saw in Chicago in 1947. Designed by David Hockney, this one leaps in and out of one dimensional space. First we see a stage in simple black and white, like the engravings, crudely etched in lines and cross hatching. Perspectives aren’t quite right, as in the originals. Then figures appear, their costumes reflecting the graphics. Film technology being what it is, lines flicker as the eye adjusts. Unintentionally, this serves only to underline the surreal effect of old film and old print. The further the narrative descends into inner madness, the more striking Hockney’s designs. In the auction scene the characters are shown in muted neutrals, wigs and clothes like paper cartoons. Only the auctioneer is fully coloured, for his is the role of observer. Even more striking is the remarkable staging of the madhouse scene. The asylum’s inhabitants pop in and out of boxes, like typepieces in typographers’ trays. Boundaries between real and surreal are overturned, just as the music subverts its formal constraints. Remarkably, this staging makes the voices in the chorus surprisingly human and personal, adding another element of insight. Garsington Manor stands on a hill overlooking the Oxfordshire countryside. Architects call this “borrowed landscape” where vistas extend beyond a property, into the distance. Garsington Opera productions follow the same principle. The stage is literally built on the terrace that connects the house to the flower gardens. The performance space is open on one side. Sometimes rain and wind intrude on a performance – as do birds – but that is part of the pleasure. "Country House Opera" is one of the glories of the English summer and Garsington is one of the highlights. This year brought Vivaldi’s L’incoronazione di Dario to Britain for the first time. Vivaldi has benefited from the upsurge of interest in the baroque, and his music is still being unearthed. L’incoronazione di Dario was first performed as part of the Venetian Carnival in 1717, so it's party opera, meant for fun celebrations. Vivaldi churned out almost 100 of these blockbusters so finesse isn't really what's happening here. Musically, L’incoronazione di Dario is standard mistaken identity farce. Arias and recitatives are fairly short and undeveloped. Ideas flash past and aren’t extended. There’s no particular structure orchestrally to detract from the lively action. It was a pity, because this orchestra was very good. They are musicians trained to 20th century standards, playing what might have been performed by basic theatre players 300 years ago. But to their credit, they appreciated that this music works better when it’s played with gusto. 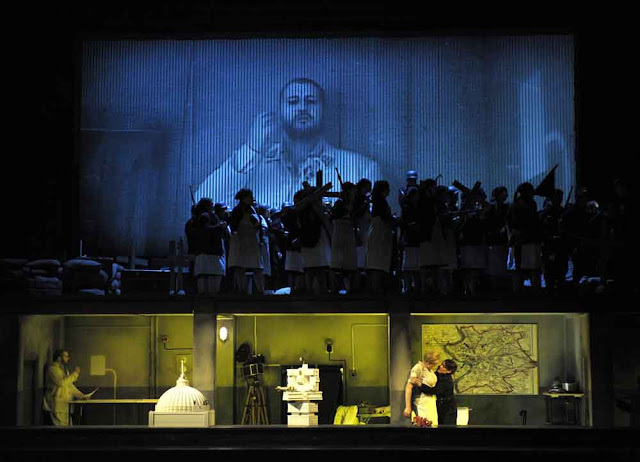 Fortunately, if L’incoronazione di Dario doesn’t quite convince as music, this production made it work very well as theatre. The plot is thin and illogical, so the staging turns its weaknesses into virtues. A huge half finished “Persian” head hovers above the stage throughout. It’s the dead King, who interjects during the course of events. At the end, his huge hand is left pointing at the stage. It’s hilarious. Argene is a princess right out of 50’s America, complete with Elvis Presley 45’s, a gingham crop top and tight jeans. Why, one might ask ? But that’s the whole point. This isn’t supposed to make sense. This is entertainment, not philosophy. So when the suitors fight, it’s cod pantomime. Casting a soprano instead of a countertenor as Arpago the suitor adds yet another irreverent touch. He/she wears the kind of military uniform Michael Jackson might take seriously, for this is the least butch soldier imaginable. So when he/she sings about being the greatest soldier the kingdom ever had, it’s a scream. But perhaps the star was the stage itself. When Statira leaves the palace and heads for the wild, dangerous forests supposedly inhabited by beasts, she can be seen parading through the neat parterres of the flower garden, he wedding dress and train blowing in the breeze. Dario runs into the garden slashing his sword to create a bouquet for her. There are lots of real flowers out there, but he brings in an obvious fake, which she swoons over. He has a “mad scene” in which he slashes one of the two trees on stage in his “rage”, but it’s artificial. The other tree is real, or looks like it is. Just as “borrowed landscape” works in the gardens at Garsington, borrowed landscape works in its opera productions. It expands the stage and participates in the drama, without singing, without music, but very much part of the action. “He writes mathematically, in the way Bach writes mathematically, but with great emotion”, said Philip Langridge recently about Harrison Birtwistle, but much the same applies too, to György Kurtág, whose music is even more precise and aphoristic. This pair of concerts placed Bach and Kurtág in beautiful counterpoise. Birtwistle’s transcriptions of Bach will be heard on 27th June. Aldeburgh programming is elegant in the way good mathematics can be elegant. Kurtág’s HiPartita for solo violin might sound nothing like Bach at first, yet it has the purity we associate with Bach. It was written specially for Hiromi Kikuchi, and has become her signature. She’s played it so often that it seems to flow out of her like a natural force. I heard her play it in November 2006, also with the Kurtàg’s in attendance. Yet it’s not an easy piece. Kurtág sets challenges in each of the eight movements. Many different techniques are used. One moment Kikuchi does an exporessive ”Paganini” flourish, the next she’s making barely audible, growling, rustling whispers scraping bow against wood. The score is spread out over eleven stands on the platform, and Kikuchi moves between them as she plays. This highlights the unity behind the different parts. One section is called Orebasìa, an ancient Greek ceremonial procession. Another is......perpetuum mobile..... Thus HiPartita functions as nonstop movement, which shifts and changes, but stays afloat, as if Kikuchi were juggling balls in the air. In many ways it’s akin to the Ligeti Piano Concerto which famously is supposed to levitate like a helicopter when played well. (See review) HiPartita is also a solo instrument precursor to Kurtág’s Six moments musicaux for string quartet, which is almost a symphony by Kurtág standards, where disparate movements are balanced in almost classical unity. It would be interesting to hear them together one day. György and Márta Kurtág had been sitting in the audience during earlier concerts, unnoticed by many, but this was their turn on stage. Márta is a very good pianist indeed, but the reason it’s so important to hear the Kurtágs play is because their performance embodies a lot about the Kurtág ethos of simplicity and understatement. They sit before a humble upright piano, just as if they were at home, in private, playing for their own enjoyment. One key to appreciating Kurtág’s miniatures is to understand how personal and intimate they are. Hence, no grand concert piano, and backs to the audience. This is private music, which listeners can join in as part of the family, so to speak. The Játékok series contains many small pieces written over a 23 year period. The idea of music as a formal, monumental structure doesn’t apply. Játékok means ”games”. Kurtág is playing with new ideas, letting the pieces fall together in different ways, like a child playing with building bricks. The extracts chosen for this performance were nicely varied. Sometimes both played in a straightforward duo fashion. Sometimes their arms cross diagonally so each is playing at the opposite end of the keyboard. Among the selections tonight were hree Bach transcriptions, balanced by canons and the Apocryphal hymn in the style of Alfred Schnitttke. Kurtág is playing with things familiar in unfamiliar ways, but always with a sense of proportion and scale. The sounds are Kurtág, but the spirit isn’t so very far from Bach. Die Kunst der Fuge was created for private exploration : Bach, like Kurtág, ”playing” with ideas on his keyboard, away from public pressure and expectations. As Aimard says in an interview with Marc Ernesti, it is ”a demanding piece, it is not pleasant, not ’effectful’, not a commercialised showpiece”. Like Játékok it’s not meant for flashy surface display. Thus, for his imtriguing concert, the following evening, Aimard chose 12 of the Contrapunctus segments from Die Kunst der Fuge and interleaved them with carefully chosen extracts from Játékok Aimard says”The Kurtág pieces open up a symmetry in the music similar to the rectus and inversus in Bach, almost like a mirror game”. He puts the fanfare in Contrapuntus with the fanfare in Játékok’s For Dòra, and places the Játékok Hommage à Paganini between Contrapunctus X and IX. Aimard also included Fuga a 3 Soggeti. Heard with Kurtàg, the unfinished character of the piece sound remarkably open ended and modern, like a Kurtàg fragment. The selection was so well planned that it’s probably worth reproducing at home to better appreciate what the combinations highlight. Aimard has recently recorded Die Kunst der Fuge for Deutsche Grammophon, and the whole concert is being broadcast on BBC Radio3 on 27th June, and for a week online and on demand. The concert played by the Kurtàg’s is being broadcast on 28th June and will also be online for a week. There should be no excuses for not listening ! Vilhelm Hammershoi (died 1916) is interesting because he's a realist painter whose work isn't realist. There's a big new exhibition at the Tate called "The Poetry of Silence". His paintings aren't really "about" what they depict. He makes me think about what music could be like this ? And here's a wonderful bit about the Gherkin - look at the pic of the penthouse emitting light ! The London panorama comes off this site.